The comet graves of Tresse and Mougau-Bihan, and the menhir of Kermorvan were built on exactly the same latitude line in Brittany, France. The menhir of Kermorvan, on the western tip of the peninsula, has the rare petroglyph of the giant Comet which caused the Catastrophe of c.2345 BC. However, the grave of Tresse at Combourg, in the east of Brittany, shows that the whole Catastrophe lasted for four months. 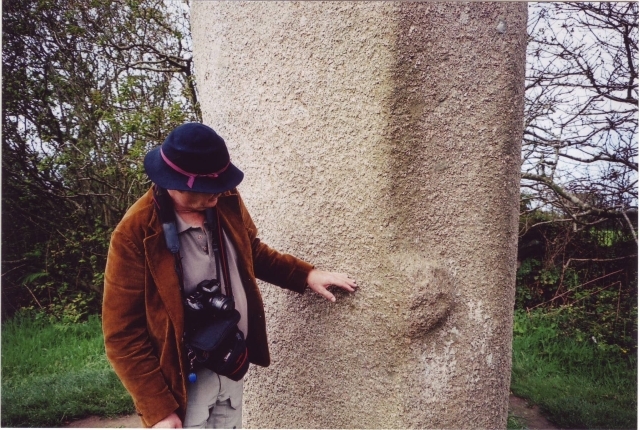 Several high menhirs in North Brittany show, that a precipitation of seven to nine meters of water during these days caused terrible floodings, in which more than half of the world population perished. It happened at the start of the Sixth Dynasty of Egypt (c.2370-2189 BC), after which all ancient civilizations on Earth disappeared. Tresse is located near Combourg, Ile-et-Vilaine, in the northeast of Brittany (fig.1).6-10 It is a gallery grave at a distance of 160km due east of Mougau-Bihan, discussed in a previous article.24 On top of its gallery part are seven coverstones, which are not shown in the groundplan (fig.2). All stones are a kind of grey granite. Opposite stone S1 was originally a slightly smaller end-stone S2, which is presently lacking.6 The small "setting stones" of this Stone were recovered. It closed the end-chamber of the grave. Tresse is smaller than Mougau-Bihan. It has a length of 12.5 meters, a width of 1.5-2 meters, and a height of 1-1.5m (although it is partly buried in the soil). In a traditional passage grave the narrow passage leads to a slightly larger burial chamber in the usual way. The passage symbolizes the "Land of the Living" and the burial chamber represents the "Realm of the Dead" a kind of Paradise. However, here, the entrance to "Paradise" is blocked by big stone S1. This blocking stone is the most important builder showing that a Catastrophe happened. So, a lot of people could not reach Paradise. Tresse was constructed on the exact latitude line of Mougau-Bihan and the Kermorvan menhir.25 So, it was built because of the Catastrophe of c.2345 BC, and the grave has the shape of a Comet. 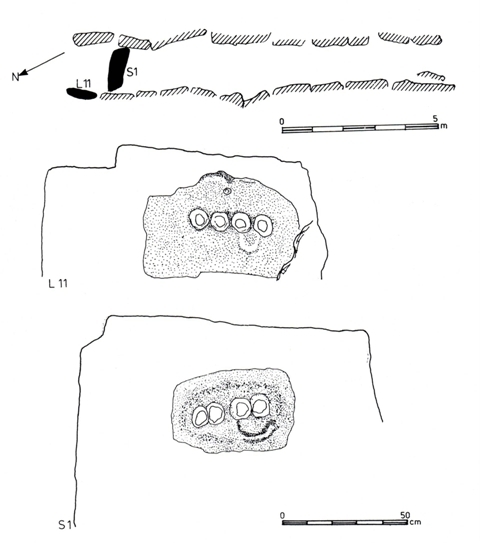 So, we ought to speak of a "comet grave" consisting of a small "head part" and a long "tail part" In the head part four bosses were carved on blocking stone S1 in haut-relief (fig.2, below). Each boss represents the full Moon, but also the so-called Synodical Month, lasting 29.5 days. So, a pair of bosses, a Double-Moon glyph, is a time period of two months, officially lasting 2x29,5= 59 days. Note, that on S1 two pairs of bosses are shown. This glyph is repeated at the inside of stone L11 (figs.1,2). The head of the Comet was the cause of the Catastrophe. Including missing stone S2, the head part of the grave contains four upright stones, confirming its duration of four months. This head part contains two stones bearing petroglyphs. They confirm the time period of two months when the Earth was in the tail of the Comet. The other two stones confirm the two months the Earth was trying to recover. 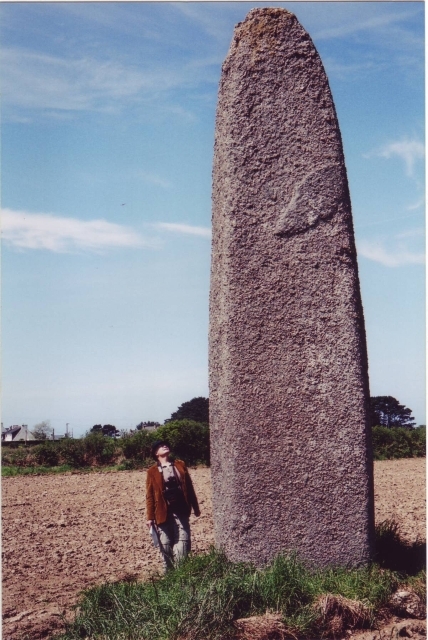 The distance between Tresse and the Kermorvan menhir at the Atlantic Coast is 2 Egyptian moiras, or 2 = 222km, confirming the two equal time periods, each of two months. The comet grave of Tresse has seven coverstones. The four stones of the head part, and the eight remaining stones at the east side, encode a world population of 4.8 million men before the Catastrophe (a number of seven figures). The grave is located at 48.4°N, correcting this world population to 4.84 million men.- Stone L1 and the adjacent Jamb Stone at the west side encode two million victims. The last two stones R8 and R9 at the east side confirm it. The other seven stones at this side, R1-R7, confirm the millions of casualties (a number of seven figures). The head part of the grave symbolizes Death. The two stones with petroglyphs in this part confirm it, again. The west side of the grave consists of two parts. Stones L1-L5 and the so-called Jamb Stone form a group of six stones, encoding an additional six hundred thousand victims (a number of six figures). The second group of stones L6-L11 confirm it. The stones R1-R6 at the east side confirm it, again. So, in total there were 2.60 million casualties. The head axes of the grave points 26°NNE, confirming it. This is (2.60/4.84)x100= 54% of the world population. The distance from the comet grave of Mougau-Bian to the Atlantic Coast (the Kermorvan menhir) equals 0.54 moiras= 0.54x111= 60km, confirming it. There were 4.84-2.60= 2.24 million survivors, most of them seriously wounded. Including the missing stone S2, the comet grave of Tresse has 22+1= 23 upright stones (Fig.2), encoding the holy Tropic of Cancer, at 23°N. On midsummer day the Sun is there at right angles above. The slow northerly movement of the Sun turns into a southerly movement. So, one believes in the SunGod! The 23 upright stones of this eastern monument also correspond to the place where the Tropic of Cancer crosses the River Nile. It is the center of the Southern Egyptian Empire, but also of the Sunreligion. Including the coverstones, Tresse has a total of 23+7= 30 stones, encoding the Nile Delta, at 30°N. It is the economic center of Egypt.11-5 It also confirms the duration of the month of thirty days, as shown by each of the petroglyphs in the head part. 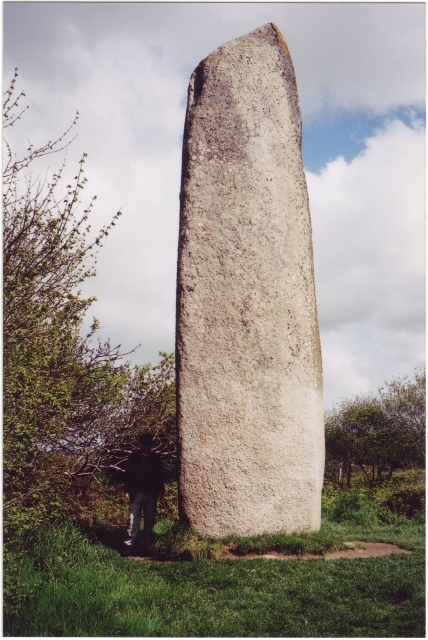 More high menhirs are found in the northwest of Brittany. 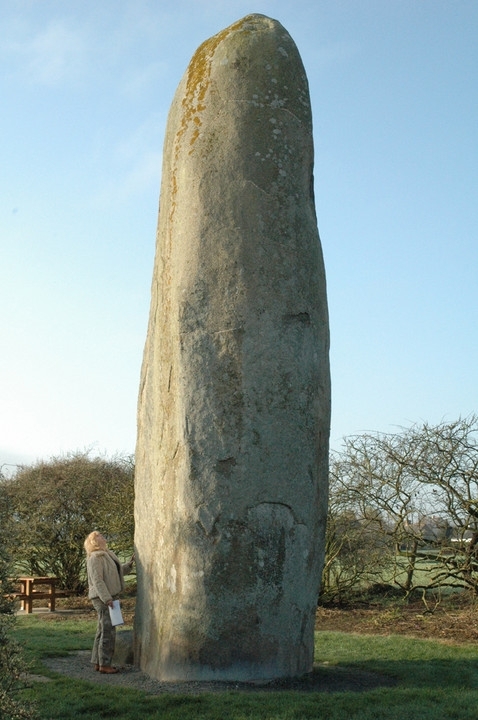 The Menhir of Kerdelvas, in Kerhouézel, is located 17km north of Kermorvan, Le Conquet (fig.4). Its official height is only 6.5 meters, but it is situated in the middle of an agricultural area, where the soil may have risen considerably during the four millennia since its erection. Maybe there is a mark below groundlevel, showing its intended height. The red colour and its nice, dressed shape are remarkable. Note the Comet glyph on the front side, and the typical rectangular base, referring to the four months duration of the Catastrophe. 2. Website: HOW THE SUN GOD REACHED AMERICA, De Jonge, R.M., and Wakefield, J.S. 13. Baillie, M.G.L., Hints that Cometary Debris played some Role in several Tree-Ring Dated Environmental Downturns in the Bronze Age, Ref.11, pgs.109-117. 14. Peiser, B.J., Evidence for a Global Disaster in the Late 3rd Millennium BC, Ref.11, pgs.117-140. 15. Courty, M.-A., The Soil Record of an Exceptional Event at 4000 BP in the Middle East, Ref.11, pgs.93-109. Fig.3 Menhir of Champ Dolent, 10km northeast of Tresse Its height of 9 meters indicates the total precipitation during the Comet Catastrophe. 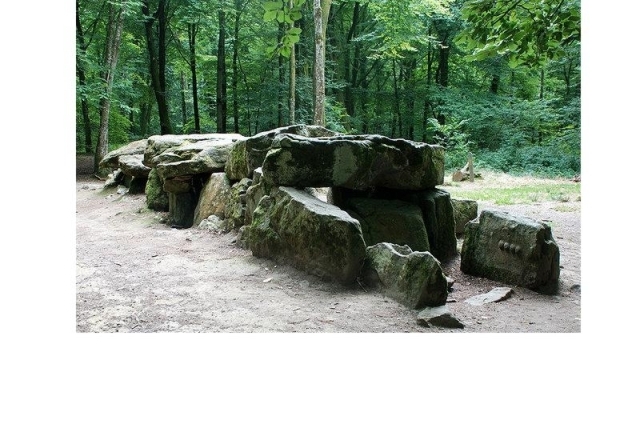 (c.2300 BC, Dol-de Bretagne, Brittany).